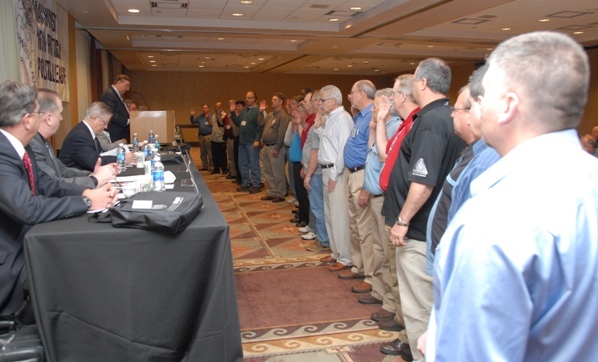 New members of the MNPL Planning Committee are sworn in by GST Warren Mart at this year’s annual Planning Committee Meeting in Albuquerque, NM. With the fallout from the 2010 midterm elections still poisoning the political landscape in more than a dozen states, members of the 2011 MNPL Planning Committee are meeting in Albuquerque, NM, to evaluate ongoing campaigns and to develop aggressive strategies for the months ahead. While the challenges facing MNPL delegates were given due attention, there were also significant accomplishments to celebrate, including innovative organizing campaigns, unique partnerships and the successful conclusion of the decade-long battle to secure the tanker refueling contract. The opening day agenda also included remarks by New Mexico State AFL-CIO President Christine Trujillo, who described the difficult economic times facing New Mexico residents, made worse by the loss of eight labor-friendly state representatives in the last election and the Walker-like policies of New Mexico’s Republican Gov. Susana Martinez.